Hello! My name is Christina Moore, wife to my high school sweetheart and mom to 3 wonderful kiddos! 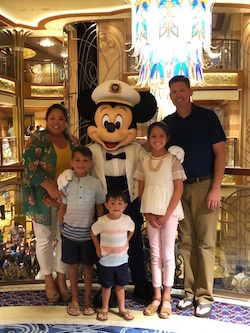 As a vacation planner specializing in Disney destinations, I want to create a vacation for your family that you’ll be talking about for years to come. As a lifelong visitor to Walt Disney World Resort and now a Florida resident that has the pleasure of visiting often, I have the knowledge on how to create a Disney vacation that suits your family perfectly. Having stayed at most of Disney’s on-property resorts, experienced dozens of restaurants, shows, special events and so many other things Walt Disney World Resort has to offer, I can create your dream Disney vacation! I love working with all clients while planning their magical Disney vacation. I have experienced Disney from the perspective of every walk of life from childhood to married with no children to married mom of three! I especially enjoy working with families as that is my own personal focus right now. I understand the hesitation that parents sometimes feel when traveling with young children and having traveled with a child as young as 12 weeks-I have lots of tips and suggestions to ensure that every detail is covered, so that you will have the magical vacation that you desire! I take the time to listen to what your family is looking for in a vacation, along with your families likes and dislikes so that I can create a personalized itinerary for you- ensuring a wonderful vacation perfect for your family. In addition to my knowledge of Walt Disney World, I’ve had the privilege of vacationing at Disney’s beach resorts, in Hilton Head and Vero Beach, cruising numerous times on Disney Cruise Line, and visiting where it all began at Disneyland! If you’re dreaming of the perfect Disney destination vacation, I can help you find the perfect fit! I am a Disney College of Knowledge Graduate and constantly stay up to date on all things Disney! I can be found on Facebook, I’d love for you to come and check it out! Connect with Christina on Facebook!